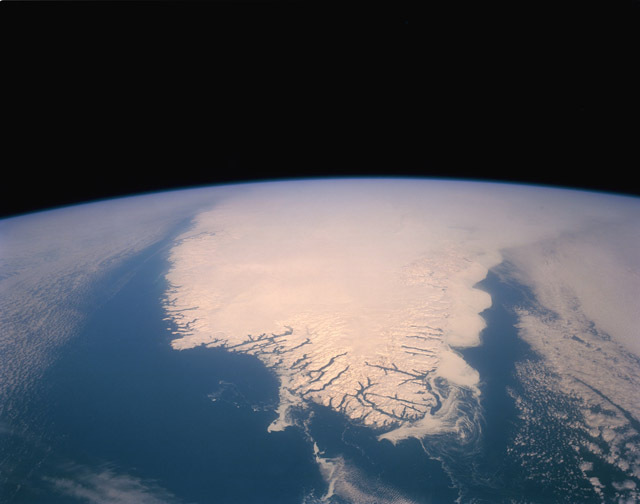 The southern tip of Greenland is seen in this high-oblique, almost colorless, stark photograph of the world�s largest island. The blackness of space contrasts sharply with the whiteness of clouds, ice, and snow. The only true color is the blue of the Atlantic Ocean and the Labrador Sea. Cloud-free conditions existing along the southern coastal area emphasize the deeply indented fjords along the coast. A close look at the white areas reveals three different features-snow and ice on the land; cloud formations over the central region and the eastern and western sides of the island; and wispy-looking ice floes off the southeast and the southwest tip of the fjord-lined coast, which are moved by the East Greenland Current to the south-southwest, and larger ice packs developing north along the east coast. Greenland has the only surviving continental glacier in the Northern Hemisphere. This ice sheet covers seven-eighths of Greenland�s surface and contains an estimated 11 percent of the world�s fresh water.